With the first experiences with amphibious operations in the Pacific, it quite quickly became apparent that the LVT’s standard firepower was not enough to deal with the bunkers, pillboxes and solidly entrenched positions of the Japanese. Heavier firepower than the usual .5o cal (12.7 mm) was needed. 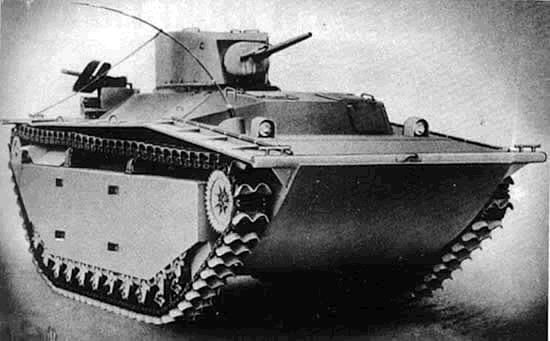 So the idea came to convert some production LVT-2 Water Buffalo as fire support ships with M3 Stuart-like light tank turrets. The “A” stands for armored. 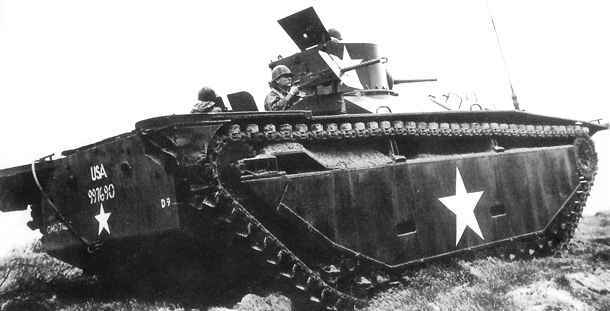 510 units were produced by the Food Machinery Corp. until replacement in 1944 by the better-armed LVT(A)-4s. 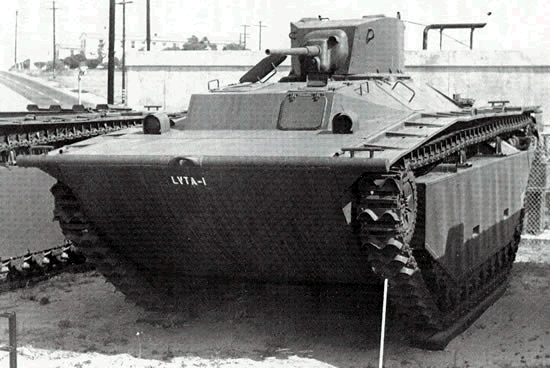 Based on the LVT-2 Water Buffalo, this fire support version had extra armor and was fitted with a turret nearly identical to that of the Light Tank M3 (modified M5A1 turret), with a standard 37 mm (1.47 in) rifled Gun M6 (L/53 -10°/25° elevation), in a M44 mount, and coaxial .30 cal in the turret. Two rear-mounted Browning M1919A4 machine guns were placed immediately after the turret, protected by standard Navy flat shields, and back gun-tube shields which protected the sides and rear of the gunners. The 37 mm was able to destroy light pillboxes and moderately thick concrete obstacles with its HE rounds but it was more efficient with AP rounds against other tanks and dug-in metal casemates (up to 48 mm/1.89 in penetration at 500 m). The entire deck was covered and armored against shrapnel, while the front was protected by 51 mm (2 in) of armor. The front drive compartment was modified, as the right-hand side became the ball-mounted gunner position for an extra cal. 0.3 (8 mm) machine-gun. The compartment was then elongated backwards in a well-sloped tumble-home on which the turret was mounted. 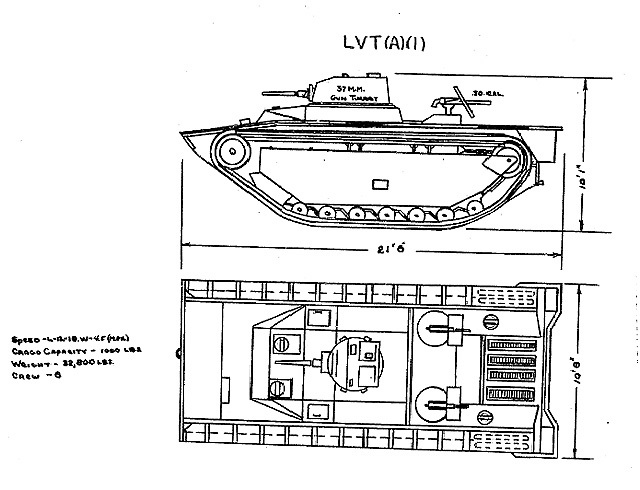 Other than that, its specifications and arrangement remained identical to the regular LVT-2, like the bolted-on grousers for easy replacement and rear engine. The crew of six had to share the internal space with numerous ammo racks. There was no room for transporting extra troops, so this amphibious tank was a pure support vehicle. On land, these vehicles were capable of 40 km/h (25 mph), but they could only 11 km/h (7 mph) when swimming. They were able to climb a 0.91 m vertical obstacle, gap a 1.52 m trench, climb a 60% gradient, and the range was about 121/201 km (water/land). The LVT(A)-1s soldiered throughout the Pacific campaign. 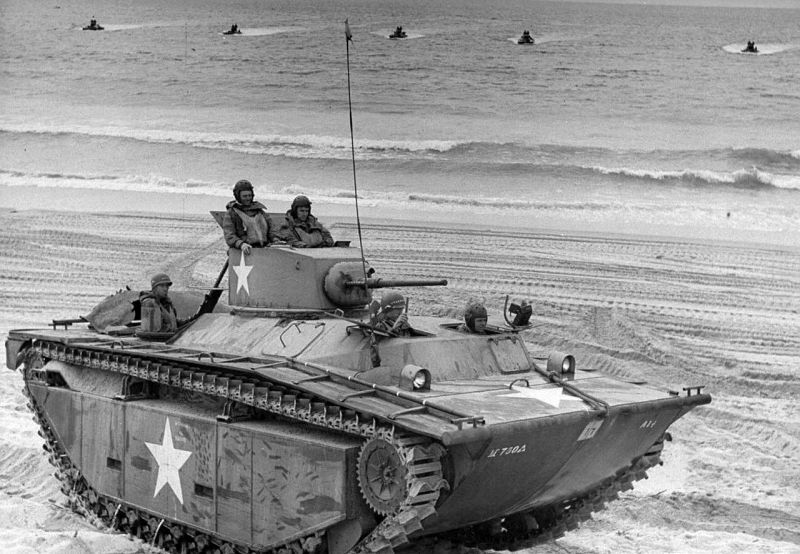 At Roi, the men of the 24th Marines were supported by these vehicles, but the reception was mild at best: They just could not close up enough to effectively support the troops on the beaches. This was noticed by Col.Hart, the regimental commander. He instead planned that these tanks would precede the infantry assault and eventually lead the advance far inland. In fact, these objectives were never reached and the vehicles ended up firing from afar, without much precision. They were slowed down or stopped by lagoon antitank obstacles and ditches. Other LVT(A)-1s also supported the 22nd Marines landing at Engebi. By mid-1944, they were all replaced by much more capable 75 mm (2.95 in) gun armed LVT(A)-4s. LVT(A)-1 in a camouflaged livery. As of today, surviving vehicles are visible at the National Armor and Cavalry Museum, Fort Benning, GA (not public), at Fairmount Park, Riverside, CA, and the World War II and Korea LVT Museum, Camp Pendleton, CA. There is also one identified rusty wreck on Peleliu Island (Republic of Palau). 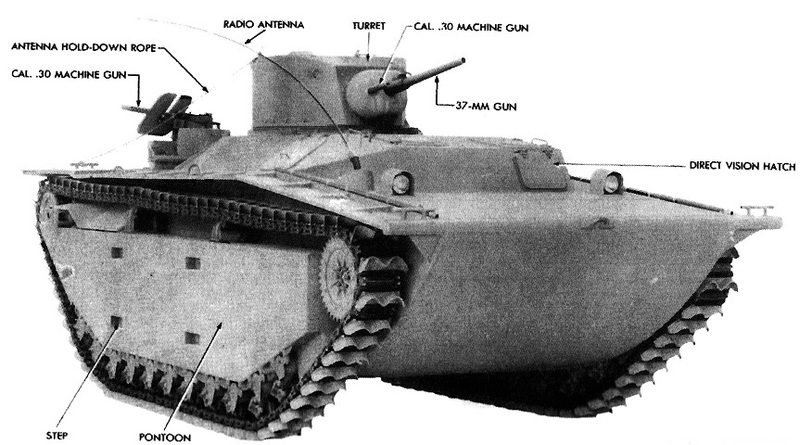 Front view of an LVT(A)-1, 1942 US archives official ordnance description. How deep of water could this tank ford? Well it’s swimming so… The only limitations (for the others, not even this one) must have been the freebord in case of rough weather since LVTs of the time were at least partly open top (and heavy). I would like to share some recent pictures of this model built by the Food Machinery company in 1940, before the war. However, I didn’t find an upload link on this site. The LVT unit is presently on display at the lake next to a national guard armory in Fairmont California right across the street from the VFW. I got to climb on it 51 years ago when I was a kid and finally found my way back to it. The LVT has been kept in good condition and is a great monument to visit on memorial day. my dad worked at the Riverside food machinery plant making these tanks. I still have a bronze model I played with as a boy. I believe it is of a later model LTV A4 with an enclosed gun turret ? 37mm or 75mm. Plan to visit the Fairmont Park exhibit this year. LVT(A)-1 if it has the 37 mm, LVT(A)-4 if it has the 75 mm. The turrets are wildly different. Could you share a photo of the medal?